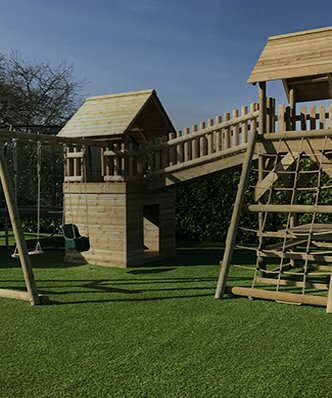 Whilst we love our wooden towers and climbing frames, the square adventure play set is also an outstanding choice for any garden. A three square metre feast of energetic challenge. Every child will choose something different, and there’s enough room for all. So, take your pick, will it be one of the two tyres to hang out and monkey about on? Or perhaps the cargo net to scramble to the top? Or the balance beam for the slow but steady wobble to the other end? Not only that, but it is possible to get all the way round. Although that’s a challenge for the older kids. So, if you want adventure play assault course style action in your home or public space, then we can provide the perfect set for you. Game on! This one goes up a notch. It is similar to the square set, occupying the same footprint, but offers much more, particularly vertically. 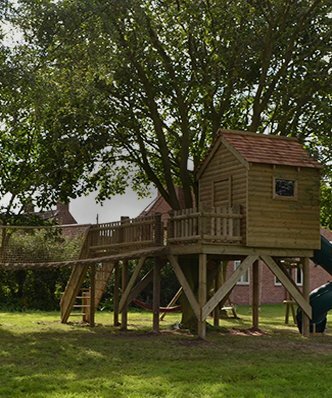 We’re confident this supersize square adventure play system has the most fun you can fit into a three by three metre space. Where to Start? Adventure Play Ahoy! The first challenge is where to begin. The cargo net rises just over two metres for starters, but the climbing beams are great fun to get on, or do you walk the plank on the top beam. The rope walk is not for the faint hearted and, though the ladder seems to go nowhere, the kids will soon be sitting on the top beam or climbing round to the cargo net. And then you get to the four connected tyres. They are a real challenge, can you get all the way across without touching the ground? This square adventure play system will offer hours and days of fun for the kids. 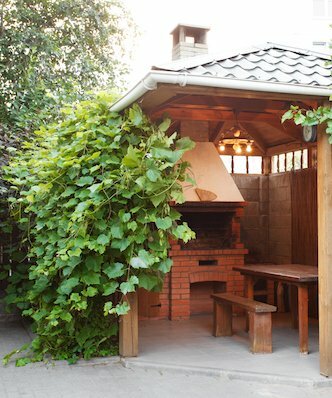 Suitable for both private gardens and commercial premises, it’s an outstanding setup. 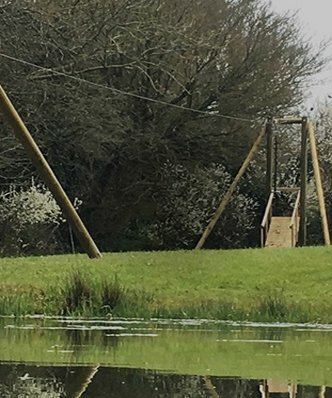 If you really want to put the little ones through their paces, then there’s nothing like the adventure trail assault course to sort the kids from the toddlers. Or sort parents from kids. Rest assured, you may have an edge at the beginning, but by the end they will be ahead of you. All of them! 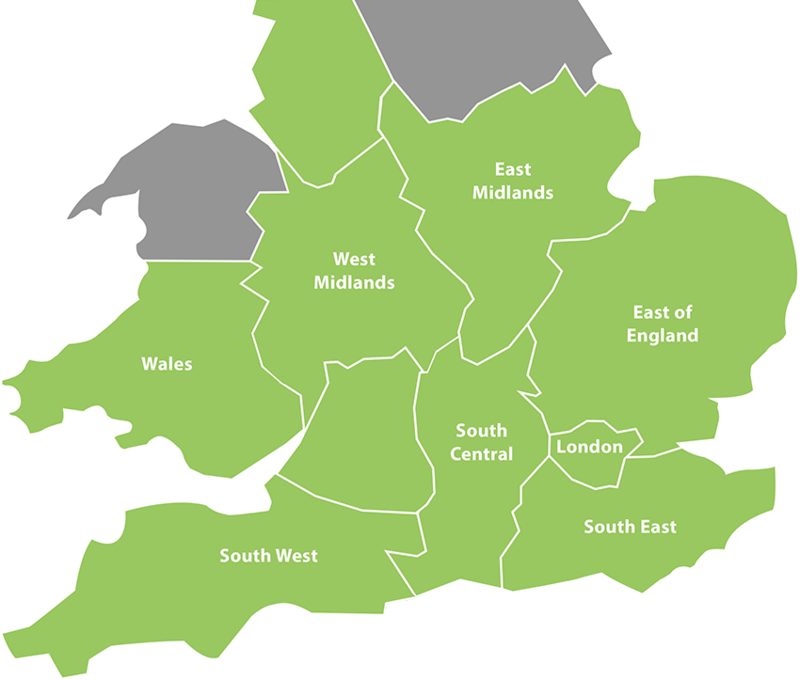 We’re not ones to complain, it really offers every type of exercise and technical challenge. Beams for balancing, ropes for swinging, nets for crossing. Not to mention exercising both the legs and arms. And that is only if you take it on from one end to the other. Each piece offers a wealth of creative play too, from escaping Colditz to being the next Daley Thompson. Er… perhaps we are showing our age there! Still, not only does it offer all sorts of activities, it also is really flexible. As all the pieces are independent, you can set it up in a line, a square or even a wiggle. In the open or through the trees. It really is our top challenge for the active kids. Do you dare order one? If you want we can even extend further up to twelve pieces for the ultimate challenge.